These brownies are seriously rich and delicious! My son love love love chocolate! And I would think that these brownies are one of his favourite because they are so rich in chocolate. I usually made these brownies with 70% cocoa dark chocolate but I've used milk chocolate this time because they are for little kids. The top of the brownies cracked as I cut these brownies into small pieces but I reckon that the crackling top gives a nice sugary crunch to these treats. Make 15 large square slices. 1. Preheat oven to 180°C. Grease and line a 3cm deep x 20cm x 30cm pan. 2. Place chocolate and butter in saucepan over medium heat. Cook with stirring for 3-5 min until smooth and combined. Remove from heat and stir in brown sugar and caster sugar. Cool for 5 min. 3. Stir in eggs, vanilla, flour and milk and chocolate bits. Pour mixture into prepared tin. Level top. Bake for 35-40 min or until top is firm to touch. Cool in pan. Cut into squares. Dust with cocoa powder to serve. I used 2/3 the recipe and use 20cm square tin and cut them into smaller squares as smaller bite size for tiny little mouths. 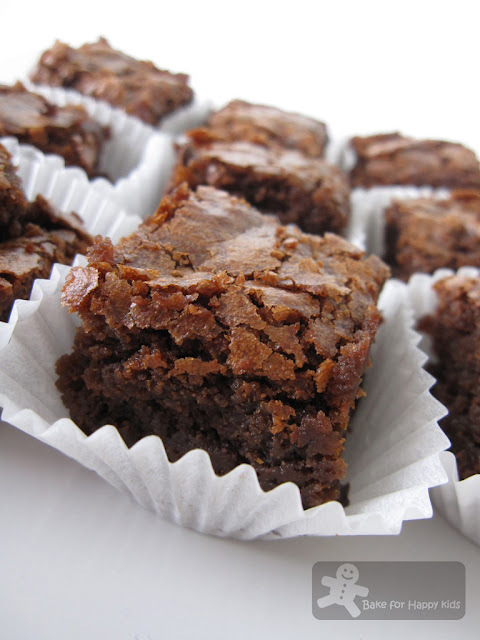 Your brownies looks moist & chewy. I haven't baked brownie for quite some time, you really made me craving for it. I bet they loved it; chocolate and children is a guaranteed formula for happiness! 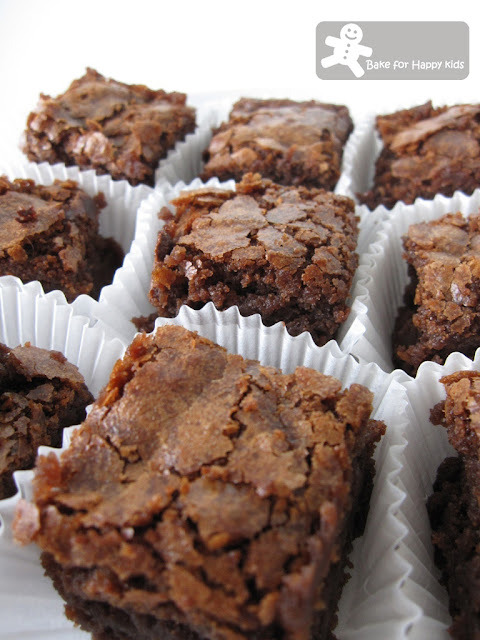 The little brownies look really moist and dense - the way it should be. this is really chocolaty! but i wouldn't hesitate to dunk them into my mouth haha! beautiful brownies zoe! These are gorgeous in their cute little packages. They sound amazing and a nice black cup of coffee to sip along side would send my evening into perfection. Yummm. Is there anything better than a warm brownie and glass of milk? fudgy and moist looking chocolatey... im lost for words to describe it because i'm distracted by the goodness of it.yum! I'm hosting the Culinary Smackdown Battle on my blog. This month's theme is COOKIES! Would you please join us for the fun? I have some cool prizes waiting too. Those brownies looks absolutely tempting and marvellous.. If they are seriously rich in chocolate then I seriously want to eat them! Your brownies sure look delicious! Brownies are always a big hit in my house. Thanks for sharing this! Oh wow, this is indeed serious chocolate indulgence, yum! Gonna forget about diet and go make some, thanks! Oh my gosh! These brownies look ridiculously good. So gooey and rich, yum! These look ridiculously good! Maybe could even rival the supernatural brownie recipe I use! oh wow! i definitely need one of these in my life! rich and very chocolatey..sound so delicious.this must be seriously good! wow! looks so rich and delish! 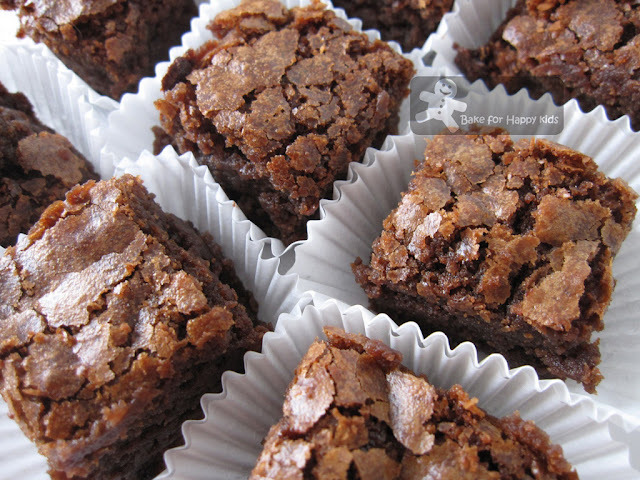 Brownies like these deserve a second comment! Thank you for the encouragement you left when you stopped by and commented on my blog! The crackly tops, the fudgey centers~WOW! What more could you want in a brownie?!? You had me at "brownie" :) I've found that my favorite brownie recipes always involve melting chocolate and butter together as part of the batter! This looks superb. Wanna try one day. Wow these looks superb. Will try this soon.